Once upon a time, I had a little, tiny, galley kitchen. I would dream of bigger cabinets, a pantry and a dishwasher. Oh, to have a dishwasher! How nice that would be. Thanks to my wonderful, benevolent father, that dream is going to come true. But of course, this is not a simple story of a kitchen getting expanded into the garage. It has been nothing short of an adventure. 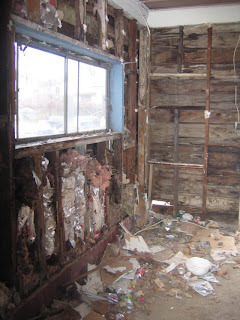 First, I hired the wrong contractors. My friend converted her garage into a room and her contractors did a very nice job. 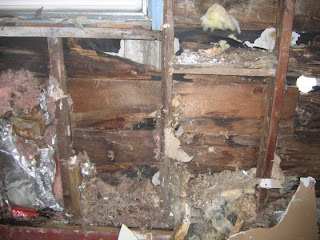 Unfortunately, I saw what it looked like after the sheetrock was up. Never base your opinion of a contractor on the final outcome. You need to see what happened during every step. They started January 8, 2008 and started working like gangbusters. 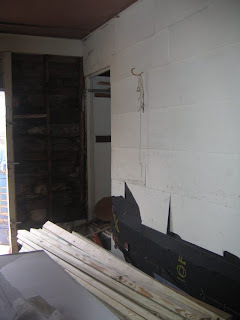 They emptied out the garage and tore down the walls within a matter of hours. 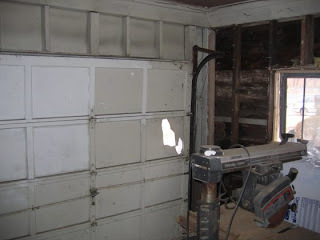 That's when we discovered the outside wall of my garage was rotted out and broken, as you can see in the last picture.